A key scene from an upcoming episode of "Tres Veces Ana" forced Laisha Wilkins to face her fears. Read our exclusive interview with the actress here! Take a sneak peek at Irina Baeva filming her first scenes for "Vino El Amor," a new telenovela coming soon to Univision. Aracely Arámbula returns to Telemundo in the remake of the Rómulo Gallegos classic of "Doña Bárbara." See official cast photos here! Two actors have been added to the "Vino El Amor" telenovela cast that will have locations in beautiful Napa Valley in California. Telemundo has started production of their new telenovela "La Doña" that will star Aracely Arámbula and Danna Paola. Angelique Boyer reveals how long it took her to prepare for her acrobatic scenes as Ana Lucia in "Tres Veces Ana." The best and worst opening credits from the current Telemundo and Univision primetime telenovelas block. We celebrate Victoria Ruffo's birthday by paying tribute to all of her leading roles in telenovelas. The star of "Tres Veces Ana" is frustrated at the way Univision is handling the telenovela and cutting scenes. Watch her express her disappointment here! 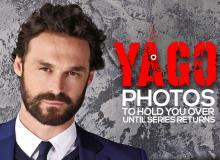 "Yago" is returning to Univision's primetime telenovela block, and this is why you can't miss it. The long Memorial Day weekend is here! Check out some telenovelas you must watch during the three-day holiday! Carmen Villalobos returns in the sequel to "Sin Senos No Hay Paraíso." The telenovela series will be a lot different this time around, watch a preview video here! "Tres Veces Ana" made its debut on Univision and the Angelique Boyer and Sebastián Rulli telenovela did amazingly well. See the moment Ana Leticia trolls sister Ana Laura by gifting her the wrong thing and compare to original "Lazos De Amor" telenovela.